UPDATED 8/3/18 11am – A man from Bear has been arrested after a crash on Olive Avenue in Rehoboth on Wednesday. Rehoboth Beach Police say around 9:30pm 39 year old Justin Anders was driving when his vehicle collided with a parked car and rolled onto its roof. Police say Anders had left the scene – but witnesses told them he went into the lobby of a nearby hotel. Anders showed signs of intoxication and was given field sobriety tests and arrested. Anders is charged with DUI, reckless driving and multiple other offenses. 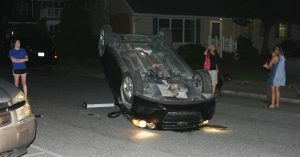 Rehoboth Beach police received numerous calls after a man flipped this Chevy Sonic LT in the second block of Olive Avenue around 9:30 p.m. Wednesday. Amazingly, there were no reported injuries, just damage to one other vehicle. Witnesses tipped off police that the man had fled to a nearby hotel. That is where officers found the man and administered a field sobriety test. No word yet on charges.